I hope everyone is having as great of a Monday-after-Saint-Patrick’s-Day-weekend as possible. This year’s St. Patrick’s Day weekend was a little bit different than those of the past. For a few years after college, my friends and I lived in the city and were walking distance to the big St. Patrick’s Day parade. We lived on the second floor of a 3-family house and our good friends lived above us, so we would join forces and host a huge bash on the morning of the parade. It was always such a great weekend and we looked forward to it for months. Granted, the clean-up the next day was enough to make us vow to never host another party again, but that feeling usually wore off pretty quickly. This year’s celebration was a little bit more low-key. We considered breaking into our old stomping grounds and hosting a party, but Will pointed out that that plan wasn’t technically legal and that he is an infant, so we decided against it. 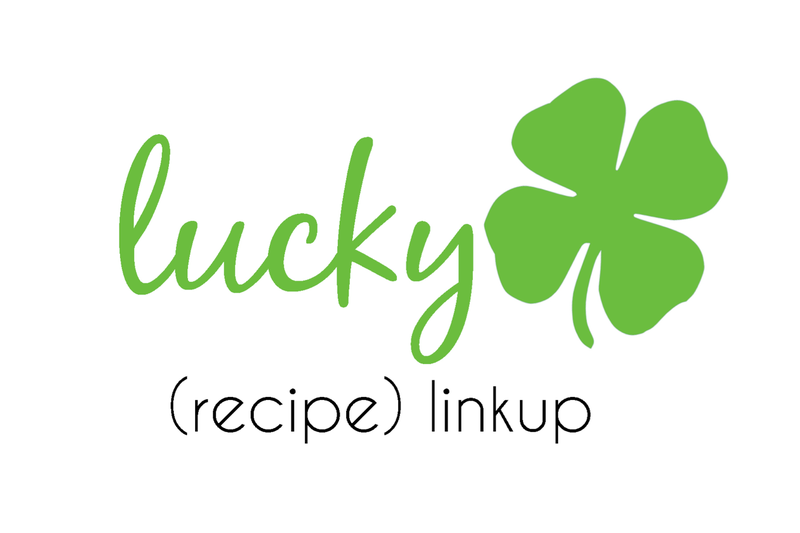 Instead, we settled for dressing Will up in a handsome cable knit sweater and making some St. Patrick’s Day treats, courtesy of the Lucky Recipe Linkup. A few weeks ago, Erinn over at Strawberry Swing and Other Things posted about a recipe linkup that she was doing with a few other bloggers. 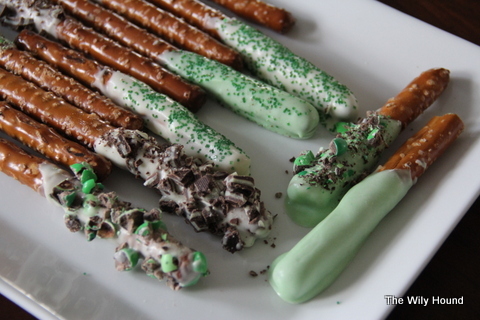 The rules were simple: share a St. Patrick’s Day recipe on your blog and link your recipe on one of the host’s blogs. You would then be paired with another blogger, and you would recreate their recipe and share the results. I shared the boozy cupcakes that I made last year (recipe here) and I was paired up with Alyssa over at Love and Life Simplified. It ended up being a perfect pairing because her recipe for chocolate dipped pretzels is “so easy that you can make this while making dinner with a baby in one arm and a toddler hanging off your legs who is repeadedly screaming “Up! Up!” and still get it all done in record time and have part of your sanity still in tact – the key word being part.” Just the kind of recipe I was looking for. 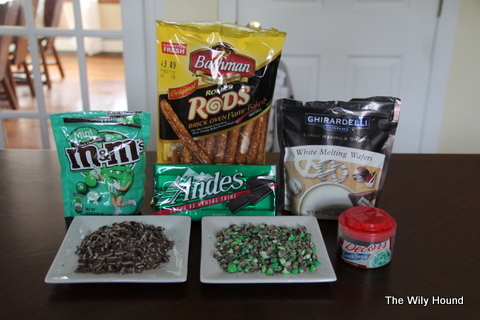 I used white Ghiradelli melting chocolate and jazzed them up with mint M&Ms, Andes chocolates, and green sprinkles, and then used green food coloring for a few of the pretzels at the end. 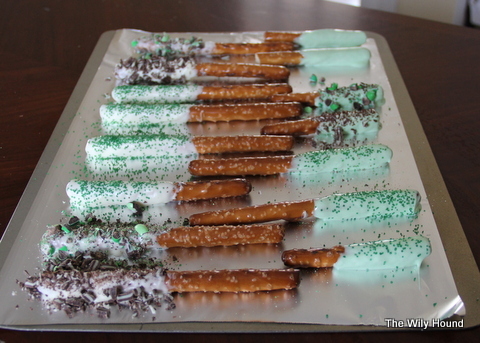 After the pretzels were dipped and sprinkled, I popped them in the fridge for an hour or so to harden the chocolate. Two tips: 1) don’t try to crush the M&Ms in a food processor, it won’t work. Put them in a baggie and whack ’em with the side of a hammer or meat tenderizer instead, and 2) if you’re going to use candy to jazz up your pretzels, sprinkle the candy over the dipped pretzels instead of rolling the pretzel in the candy – it will stick better that way. Quick, easy, and delicious! Have a great week!